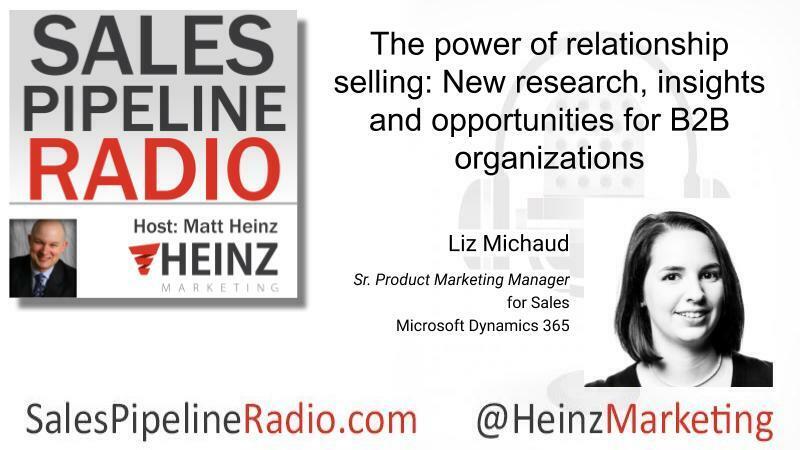 My guest this time is Liz Michaud, Senior Product Marketing Manager for Sales at Microsoft Dynamics 365. She shared her insights into the current trends, good and bad that they are noticing. Role specialization in particular seems to be causing an over-emphasis on teams to take on the productivity piece. This causes a loss in that personal touch and building strong relationships. We are still people buying from people. "Over 80% of our respondents in the study who said that they were effective at building relationships across the buying committee with multiple people, they were the ones who also said that they were effective at achieving their desired sales goals." Naturally integrating Microsoft's CRM and LinkedIn it creates efficiency for the sales rep to get back out of the tool and get back to actively selling.Having a full picture of the buyer and their timing to be able to synchronize all the data. This looks different in each organization, depending on the tools, but it is critical in every setting. "It is so important that a marketer knows the tactics and strategies that they're using are actually working. And you can bring in all the leads in the world, but if they're not quality, then your sales team, is going to be pretty unhappy."